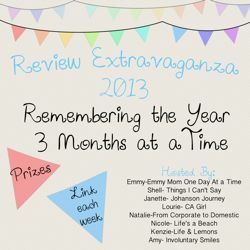 For Week 2 of the Review Extravaganza, we are looking back on April, May, and June. You have from today thru Wednesday, December 18th to link up. If you missed week 1, no worries- just review January-June in your first post and link it up! 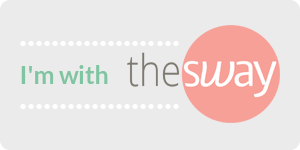 There are over $600 in prizes up for grabs for linking up. You can see full details and prize info here. Lots of soccer in April- and all year, so I had to mention it somewhere! Home Depot Flower Tower I learned that it’s not as hard as I thought to turn my black thumb into a green one. Happy Parenting Tears I share a lot about the rough moments of special needs parenting, but sometimes, things go right. Why We’re Not Getting Ready for Kindergarten How we decided to “red shirt” our would-be kindergartener. In May, we bought our first house. Teacher Appreciation Gift Ideas can also work for Christmas! Your Blogging Voice Find your voice and don’t apologize for it. Finding Home After years of moving around, we finally bought a house and I feel like I know where home is. School was out in June, so lots of swimming and camps to fill our time! Rockin’ the Bump this is one of my favorite link ups. Can’t help but smile at all these baby bumps. Reevaluation Results where we thought we’d learn more, but were just left with questions. Now it’s your turn to review your year with us! You have until next Wednesday to join in and you can catch up if you missed week one. Grab the button from Emmy Mom’s blog, link up below, and don’t forget to visit other linkers, too. Congrats on buying your first home! I’ll have to check out your posts – they always have such neat and intriguing titles! I remember how excited I was for you about getting the new house…I love that house so pretty! Congrats on the new house! I think that the Red shirting was a good idea! I love all your post titles they make me smile! and for this reason they are most sought after by bargain shoppers. Love these posts. Its been great getting to know you through this link up! So awesome you were able to buy a house this year. We are just renting, a lot because we never know how long we will be somewhere. I love our house we are renting and our landlord is awesome but I definitely finding myself wanting to buy so I can say it is my own. Thanks so much for doing this with me. Yes, your first house, and those boys in that soccer picture! Love! Congrats about buying your first house! It must feel so great to put down roots. I wish I had seen your post about Teacher gifts sooner!! I need these ideas all the time! Your home is gorgeous – congrats! Love what you said about finding your own blogging voice. I think diversity is what makes the blogosphere such an awesome place. Hoping to link up tonight… I’m way behind on life at the moment (though I’m not sure how that’s different than most other moments). I love that house it is beautiful I hope you are all enjoying your first Christmas in your new home. Outstanding items below. Now i am willing to visit your content. Thanks a ton and I’m waiting for contact a person. Do you want to nicely decline me a snail mail? We are a bunch involving volunteers and starting up a whole new design in our local community. Your website provided us practical data so that you can art upon. You may have performed a new strong activity and the whole area are going to be glad to you personally. Generally I don’t learn write-up about sites, even so would wish to state that that write-up quite pressured everyone to see and also do it! The crafting tastes has become stunned myself. Thanks, very nice article.